Looked great on my Holiday table! Very nice quality. 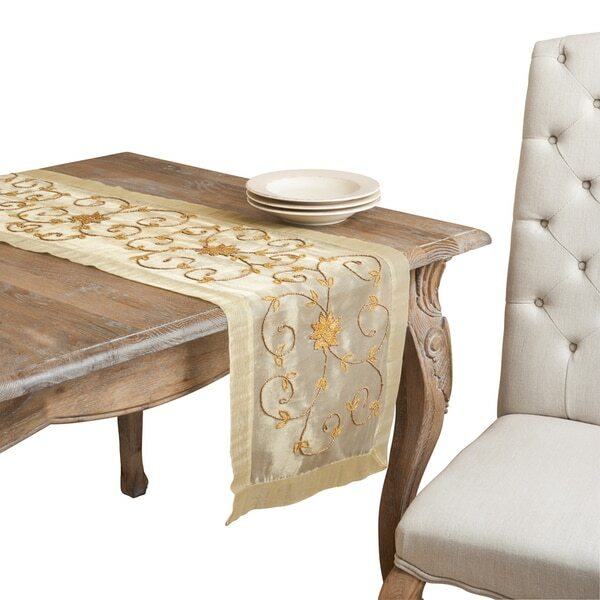 The only accent you need to add a touch of elegant decorum and texture to any table, this handmade beaded table runner is a classic choice for discerning home decorators. Use it in a library or living room to add a classic touch to your decor. The perfect complement to antique style end or dining tables, this unique piece is sure to spruce up any setting. 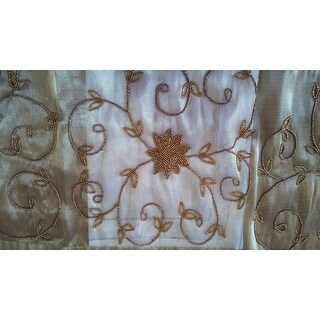 Option: Gold - 16" x 72"
The crewel embroidery is gorgeous. The pattern is intricate without being over-done. The craftsmanship is excellent with the beads securely fastened in place. I don't like the gold color. It says olive in the written description but looks gold in the picture, so I ordered it anyway. It is a light olive but I can live with it because I like the beading so much. 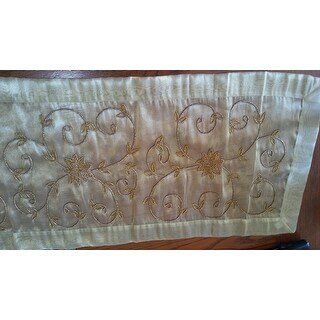 Option: Ivory - 16" x 36"
The item is of inferior quality. I ordered four of these and ALL of them had brown spots on them and one had a run in the material. ALSO, the beige ones were HALF the length of the other colors and were 2/3 the price. Does not add up!!! If you want to glam up your table...this is it! The color is sort of dirty or greenU tinge gold. The beading is beautiful. The beading is actually a combination of gold and bronze colored beads Extremely well made. Definite show stopper. 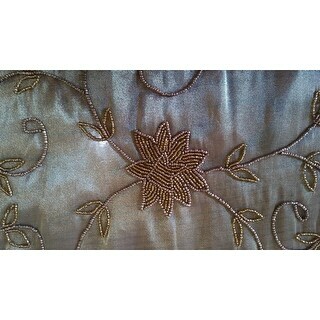 This runner is just the right touch for my buffet - adds a little sparkle without being overdone. very pretty, delicate. color not exactly what i expected and does not mesh real real with rustic look. i was initially going to put this on my dining room table but moved it due to not looking right on a rustic table top. This a beautiful runner also but it didn’t hold up that great after trying to hand wash it the beads started to fall off. These runners are very delicate. This is a gorgeous piece but slides easily and the raised beads make it difficult to have items sit levelly on. Beautiful! Great price, and prompt delivery! It was delivered fast but unfortunately it looks cheap... Also, its color is greenish not gold. Beautiful! Well made just as I expected! Happy I bought it! Looks beautifully made. Can't wait to get it.